What happens when you put the No. 1 USTA National junior player against the No. 1 ITF World junior player? You get a great match-up of two hard-hitters that was much closer than the 6-1,6-3 score showed. 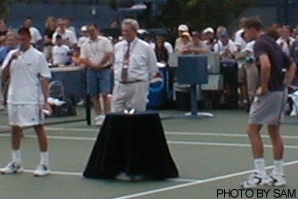 From the start, Andy Roddick and Robby Ginepri gave the crowd a display of their talents. 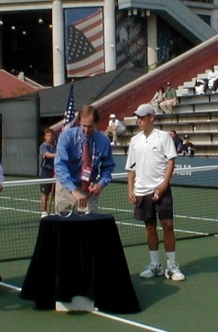 The first game went deuce three times before Roddick took the game and his first break. The two had only played against each other once before this year -- Australian Hardcourt Junior Championships -- and though Roddick had won, everyone knew that Ginepri was having such an incredible tournament that he wasn't going to go out as easy as Roddick's previous victims. The large crowd was correct in this asumption. Though he had two break points at 4-1, Ginepri could not get past the Roddick serve, which had been clocked at 139 mph at the beginning of the tournament. He hung in there, though, bringing the games to deuce and finally making Roddick go through four match points before he could claim the trophy. This is the last time these two have the opportunity to play in a junior grand slam event. Roddick turned 18 years old on August 30th and Ginepri will do the same in a few weeks. Roddick has already joined the professional ranks, but Ginepri is still undecided as to whether he will go to college. In a heartfelt acceptance speech, Roddick -- who until this moment was not a favorite with the audience -- turned to Ginepri and said with honesty, "Robby, great week -- you played awesome." Roddick also thanked his parents and then dedicated his win to his Uncle Azel and Beth, a volunteer from the Nationals, both of whom recently past away. Just after the boys' ceremony, the girls finished up their match. The No. 1 seed also took this event as Maria Emilia Salerni -- pictured right -- defeated Tatiana Perebiynis, 6-3,6-4. The two had met twice before this year, with Salerni also winning -- though not by much -- each of the previous events. The games were close, but the top player in the world pulled out the majority. Salerni, who will not be 18 until next year, will be next heading for the Olympics in Australia where she has been given a wildcard into the singles draw. Peribiynis -- pictured left -- will turn 18 in December and no longer be eligible for junior events. It was a very exciting U.S. Open that I am happy to have had the chance to witness from beginning to end. There was a lot of talent out there that we will see much more of in the years to come. And, for the first time in 15 years, we saw an All-American final in the boys at the only American Grand Slam event. Though most of these players will not be back in the juniors next year, we all wait with anticipation at the next group of talented young teens. HOW CAN ANDY RODDICK PLAY THE JUNIORS?